And so, from hour to hour, we ripe and ripe. I like a good Shakespeare quote, and this one fits the circumstances of the past couple of weeks, at least for me. Parents and carers of kids with FASD are busy. So busy. There’s never enough time. There just isn’t. For us, when you aren’t dealing with the day to day, then there is the relationship with school to manage, or appointments at the doctor, a seemingly endless round of trips to one hospital or another, from therapist to counsellor, from consultant to nurse. Even the extra loads of washing take time. The supervision of the day takes a huge amount of energy, and at almost any time, a meltdown can bring everything to halt for hours while we help our young man to re-regulate and things can get back to (FASD) normal. When you combine all this with work, the rest of the family and everyday life, time is squeezed. There just aren’t enough hours in the day. So things slide. Sometimes important things. That’s what’s been happening to me. I let things go by that I should have been noticing, or I did notice but didn’t pay attention to. My wife worried at me to look after mysef, to get some checks done. And I brushed her advice off. Sinking into the sofa exhausted at the end of the day, every day, had become my normal. Having a little afternoon nap had become normal. I got extremely thirsty all the time. I felt below par every day. This was my normal. And I wrote it off to the stress of living with a child with FASD (and another with chronic fatigue). But, it came back to haunt me. Just like the advice on the aeroplane, if the oxygen mask falls then put your own on before trying to assist others, I should have been taking care of myself. A couple of weeks ago I went to the doctor complaining of a persistent cough, which had lasted since a virus knocked me flat in February and triggered my asthma. She asked a lot of questions, and sent me for blood tests and chest x-rays. Fast forward a few days and the doctor’s surgery calls and tells me to come in that morning. An hour later she tells me I have Type 2 diabetes, and after discussion, I have probably been in an acute phase of the condition for at least 18 months. Looking at the blood sugar results she tells me it’s ‘a bloody miracle’ I’m not in a coma. Later, with the diabetes nurse, she shows me how to use a blood sugar testing monitor. The result is too high for the machine to read – it just says “HI” on its little screen, meaning my blood sugar is over 33, when I’m aiming for 8! For good measure I need to get my cholestorol level down. And lose a bit of weight, although I’ve lost two stone since the doctor last weighed me as a result of the untreated diabetes. Back home, my diet changes immediately. Gone are the carbs, salty and sugary items that made up a lot of my diet – and that includes the grapes and yogurts I was eating a lot of. Convenience eating is a thing of the past. Everything is measured, considered and prepared from scratch. My wife is delighted about this bit, and a Mediterranean Cooking for Diabetics book appears immediately. She gets to cook all sorts of things she loves! Two weeks on (with the help of some meds) my blood sugar is low and relatively stable. I’m learning to live with diabetes and starting to feel better. I’m not getting up two or three times a night to pee. I’m feeling more rested from a night’s sleep. I’m less prone (I think, check in with my wife) to being irritable because of fatigue. Things are on the up. This means more energy to deal with the things that life throws at you. More energy to look after our son. I’ve started taking care of myself, and it means I am in two short weeks, better able to take care of him. And that, in a nutshell, is the moral of the story. Take the time to take care of yourself, so you can take care of the others in your life. And how necessary is that when you have a young one with FASD in the family. They need you to be at the top of your game. Every day. Listen to your body. Act on the signals it sends. Try not to “rot and rot” as the bard put it. I knew he was sick. He says I “worried” at him. It was more than that. I knew what I was seeing, my father had diabetes. Combined with high cholesterol and heart issues, diabetes took my dad’s foot and contributed to years of very bad health leading to an early death. I was scared by what I was seeing. And yet, the days and weeks and months and possibly years passed. I cannot tell you how guilty I felt when I realised not just that he has diabetes, but how serious it had become. Because of FASD, we are faced every day with the kind of in-your-face urgent issues that cannot be ignored. Of course we are tired. Of course we are snappy with each other. Of course we feel down. Of course we take short cuts. Our interactions have been curt and far from the hours-long discussions we used to have about issues big and small. I felt he was being selfish by not looking after himself. I felt he was whinging. I grew up in a “if-your-cut-hand-is-not-falling-off-keep-playing” kind of large family. I had told him (repeatedly, and even in front of his mother a couple of times) what I thought was wrong. If he chose not to act on it, I was not going to nag. Except I didn’t grant him, my partner in this life, the same courtesy I grant to our child with FASD. I never thought he was as badly affected as he is and that a medical condition might be underlying behaviours. I nearly cried when one of my sister-in-law’s friends who has diabetes said that she had never heard of anyone having readings as high as his and that this must be making it really hard for him to control mood swings. I didn’t for a second imagine his outbursts that threw me through the roof myself might actually be due to blood sugar swings. I didn’t think his behaviour might be a symptom too – and that is the mantra of FASD parenting. I should have trusted my lovely husband enough to see this for what it was. I am surrounded by people who have medical conditions that are demanding. Diabetes. FASD. Chronic Fatigue Syndrome/ME. I am certain the stress we all live under is playing a negative role in all of this. I myself was in hospital a couple of years ago with neurological issues. The pace is relentless. But if you are reading this, most likely you are familiar with it. We are not alone. 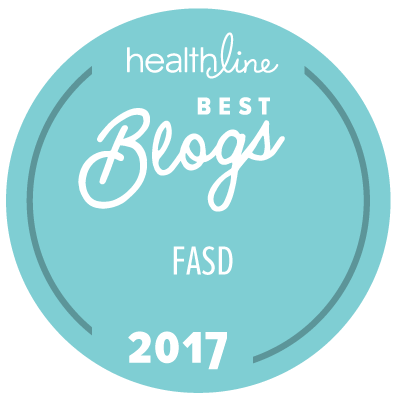 I know of too many individuals and families coping with FASD where the stresses drive peoples’ health into the ground, where relationships get torn to the point of no return, where depression takes hold. We have to do better. As my husband says above, we have to “take care”. We have to take care of ourselves and we also have to take care of each other too…maybe a bit more aggressively than the British culture is comfortable with. Maybe we need to force those difficult conversations. Lives are at stake. This isn’t optional. I am glad he caught this before worse harm was done. I am thankful it’s something we can manage. He didn’t mention above that they also were screening for cancer at the same time. There is a reason why we haven’t posted a blog post in a little while. It’s been quite a ride around here lately. …now, where is that reminder about the smear I was due for ages ago…? It is a relentless, tiring and sometimes thankless job raising these kids in a world that does not accomodate them. No wonder it becomes all consuming. You have had a narrow escape and hopefully are on the road to recovery. But it won’t be easy, changing lifestyle whith a FAS child, to whom any change is traumatic is daunting. Wishing you much encouragement and strength. No matter how hard it is your health is your sons best shot at life. Thanks. You are so right. So far the diet change is good, and we’ve had to do separate meals for our little one for years now. Keep on keeping on. So true! A life saving reminder.